Since we enjoyed yesterday a libertarian version of the night-before-Christmas story, let’s continue today with the holiday spirit. During previous Christmas seasons, I’ve shared Keynesian Christmas carols, a great Jay Leno joke, a video of Santa as a small business owner dealing with red tape, and a look at the all-important question of whether Santa is a leftist or conservative. Today, though, let’s be momentarily serious and enjoy a Christmas present to the nation from an unexpected source. The Obama Administration has announced that the odious practice of asset forfeiture is going to be curtailed. Here are some excerpts from a Washington Post report. The Department of Justice announced this week that it’s suspending a controversial program that allows local police departments to keep a large portion of assets seized from citizens under federal law and funnel it into their own coffers. The “equitable-sharing” program gives police the option of prosecuting asset forfeiture cases under federal instead of state law. Federal forfeiture policies are more permissive than many state policies, allowing police to keep up to 80 percent of assets they seize — even if the people they took from are never charged with a crime. …Criminal justice reformers are cheering the change. “This is a significant deal,” said Lee McGrath, legislative counsel at the Institute for Justice. But don’t get too excited. This almost certainly is not a sign of genuine libertarian thinking inside the Obama Administration. Indeed, the story suggests that the Justice Department made this change at least in part because it didn’t want to share money with state and local governments. Good, I’m glad they didn’t find a “conceivable option” that would have enabled the government to continue stealing property from people who haven’t been convicted of wrongdoing. Now that we’ve been serious, let’s get back into the Christmas spirit. 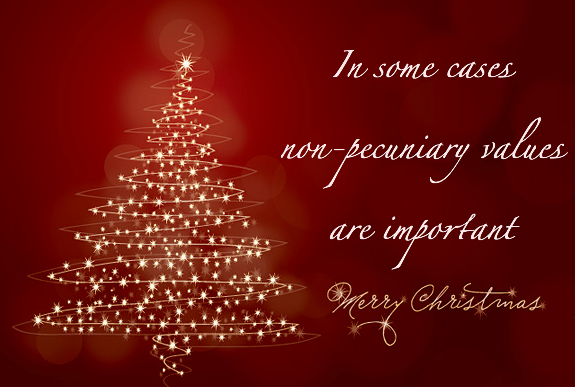 An article in The Atlantic looks at Christmas cards, as designed by economists. Mostly they showed why we’re not at the top of people’s invite lists for holiday parties. Here are my two favorites. Yup, only economists could describe things like love and family in this fashion! I don’t even know how to characterize this card, but this sometimes is how economists think. 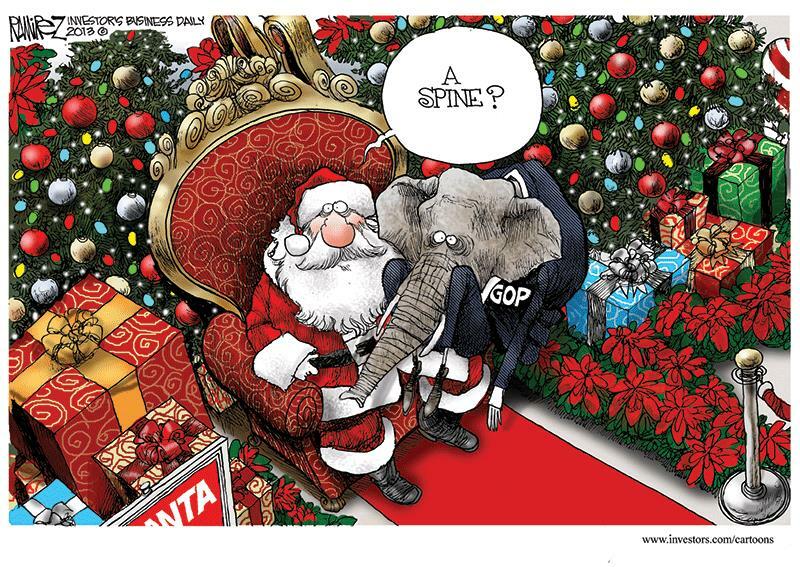 Last but not least, here are a couple of great Christmas-themed cartoons from two years ago, both by Michael Ramirez. We’ll start with a Christmas wish that Santa hopefully granted. After all, a GOP with spine wouldn’t cower, as illustrated amusingly by A.F. Branco, when Obama threatens a so-called government shutdown. Our next cartoon looks at an implication of all Obama’s spending plans. 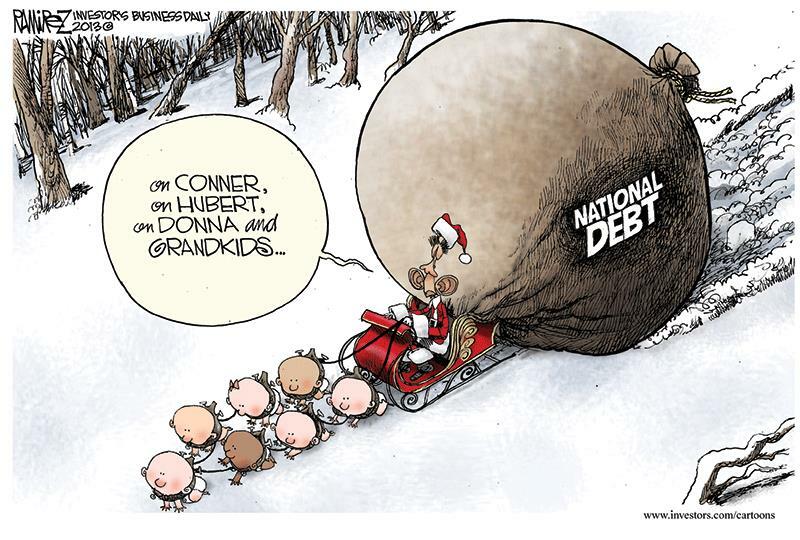 And if you wonder about the size of Santa Obama’s sack, just check out these very depressing numbers. After perusing that data, some of us may not be feeling like our statist friends deserve any holiday cheer. But this is Christmas, so let’s try to feel love and joy. 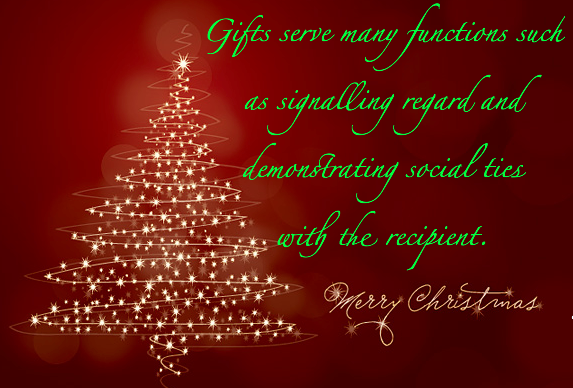 So if you see some of your government worshipping friends and family today, we even have a Christmas greeting that’s appropriate for leftists. Asset forfeiture. Note the word “suspended”. FedGov is concerned that local police are taking too large a cut of the stealings. This is a negotiating tactic to adjust the cut, then asset forfeiture will be back in business. It is premature to credit FedGov with anything good.